Unlike Superman, she doesn’t have laser vision and a mirror. Superhero haircut! This page made me so happy. I can just imagine the writers having too much fun discussing stupid ideas of how this should be carried out. The secret to defeating Alison’s invulnerability? I guess when you are a superhero even your hair is near indestructible. Love it. So, am I seeing this correctly? Isolate a strand of her hair, blast it with liquid nitrogen to get it to be brittle, and then attack it with a angle grinder? I am thinking that with all those precautions, she is still going to need to replace the blade fairly frequently. Really, its scenes like this that make this comic for me, so casually weird, so abnormally normal. Same here…but I think what makes it even better…is that with all these types of scenes…it’s going to make an actual fight with a villain, whenever it comes to that, that much better. So, liquid nitrogen and a… diamond-tipped buzzsaw? I’d think they’d just train a hairdresser to use the equipment (or a pipe-fitter to dress hair!) rather than risk a doctor’s hands or eyes on a process that looks about as safe as performing repairs on a thresher in motion. There should really be a guard to keep stray hair from getting caught on the axel of that saw. It may not make logical sense, but it’s also very sweet that Alison’s doctor and therapist also cuts her hair. Maybe they decided having her do it as a way to further build their rapport was worth the risk. But most importantly, this scene makes me smile a whole lot. Considering the risks of this procedure, her eyes look pretty well protected, and those gloves and apron could well be armoured as well as insulated. Also, it’s worth noting that doctors manage risks to their own health in their day to day jobs all the time, albeit usually more prosaic ones. Particularly: insufficient sleep (the leading cause of death in young doctors is falling asleep at the wheel); easy access to means of suicide and the knowledge to use them well; violent patients/friends/relatives; and, of course, infections. If, as seems more than likely, this lady has been Alison’s doctor for some time, she may well have pioneered this procedure and still be refining it, and thus not in any hurry to palm it off on a hairdresser yet. Especially as it lets her play with cool toys. BTW, a friend of the family died last year in a pipe-fitting accident – he was cutting pipe in a ditch in a bad position, and the saw jumped the wrong way, severed a major artery before anyone could react. I have a sneaking suspicion that Alison’s invulnerability may have progressed too far for this to cut her hair anymore. The last panel shows her hair being cut. I doubt it. Her invulnerability seems to be an active phenomenon. And now we know why Alison can never completely server her ties to the government. She really likes her current hairdresser. True but I know some metal workers with an artistic flair. 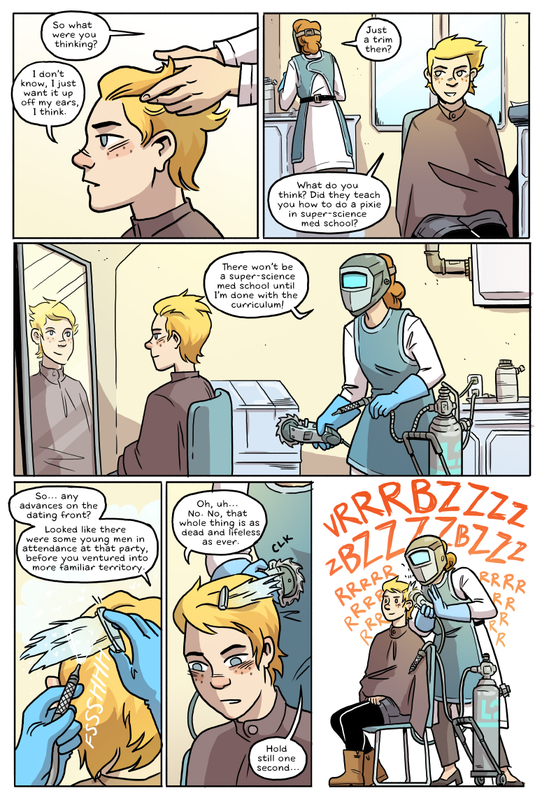 I think hair is mostly dead skin cells, so it might make just as much sense for her hair to have normal durability, since they are non-active cells, but it’s your comic haha, love this comic so far by the way! Hair is a secretion. It was never alive. You’re probably thinking of the outer layer of your skin. This doesn’t really change your point though. I’m kinda worried that this sort of treatment is going to make her hair very sharp at the ends. Given that there’s nothing really abrasive enough out there to naturally wear the ends down, strands of hair are going to retain their sharpness for a good while. Maybe that’s also been part of “operation cut Alison’s hair” ever since someone had to spend months in reconstructive hand surgery for messing with her hair. I seem to recall Diamond Lil using one of her hairs like a needle. I guess it’s lucky that hair is dead cells. I figure the cells retain whatever invulnerability they had when they were alive, but since they’re dead they don’t adapt to damage (like her scar did). Otherwise, after one or two haircuts her hair would be too tough for even the NO2 + diamond saw combo. Man, kinda gruesome, but… what’s gonna happen to Alison’s body when she dies? Will it ever rot, or will her invulnerability prevent any microbes from chowing down? I guess it will depend on what “powers” her invulnerability. If it is due to her being alive maybe it will dissipate when she dies. Or not. It could be, yeah. It’d have to be some kind of weird entanglement thing, though, since her hair is removed by several inches from any living part of her. Hair is pretty much protein filament, actually. The cells are down at the follicle, making the protein. So, do we know the doctor’s first name? It isn’t Delilah, is it? Not necessarily! It’s likely her hair is still as invulnerable in relation to the rest of it. Kind of like how normal hair isn’t nearly as tough as a femur. Yeah, but you should be comparing it to skin, not a femur. That’s a cool way to get your hair cut. I just like how chill and relaxed Al looks in the last panel. Like this is the most soothing thing in the world. I hope she has ear protections, tho. I’m guessing she doesn’t shave. Her hair is already dead, though. I think the good doctor might have a minor crush on Alison? I’m wondering whether the doctor has had any training in hairdressing. What if a bad haircut causes Alison to go on a rampage? Since hair is a non-living secretion, I would think it would not change just because ot had been detached. Except that there’s a significant implication that Alison’s powers are really more psychic in origin than physiological. Stephanie Gertsch’s TANGLED joke above may in fact be about how it works. Well I read all of this comic last night, I was wondering how her hair was cut… I can only guess the tools used for a Mani-Pedi! I wonder how she cut her hair while her identity was secret. I started chuckling like mad when I saw the 3rd panel. This is ridiculous. Hydraulic shears would cut better than a coarse toothed saw, and you could actually use it well enough to give her a normal haircut. I don’t think this doctor knows what she’s doing. Or she’s just doing it this way for her YouTube channel. Same way, same person. The Guardians were in on each other’s secret identities, and they have government backing even now. Poor Clevin – not even a passing mention. Would they cut Alison’s hair? Almost definitely, at least at this stage of Cleaver’s progression. He cut her skin, which ought to be much tougher than her hair, and I’m pretty sure he got some of her hair in the process. The strength required to work scissors is just a matter of how much the parts weigh and what kind of friction exists between them. Cleaver is tough and sharp and large, but he’s not necessarily super-dense or anything, so presumably anybody could work a set of Cleaver-scissors if they were small and well-constructed. It’d be easy to construct them, too- Cleaver says he cuts himself without even trying; if he applied his blades to each other he could produce super-sharp shards easily. The question is whether Cleaver’s hardness and/or sharpness are persistent qualities of the material in his body, or if they’re like Alison’s invulnerability and would fade in body parts that get separated from him. http://strongfemaleprotagonist.com/issue-2/page-41/ It says in this alt-text that he’s a “muscular, dermal and osteodynamic savant”, which means his power affects his muscles, skin and bones- presumably by growing them bigger and into weirder shapes. If unusual growth patterns are the full extent of his power, then the outward effects- strength, toughness, size, sharpness- are all purely physical phenomena and would persist in detached Cleaver-bits. If not, we don’t know enough to say. She was under government protection as Mega Girl, and had the same doctor. I’ll bet there’s a line item on the government’s budget for “Mega Girl’s haircuts”. How does she get her nails clipped? Dip her hand in liquid nitrogen and then hold the nails to a grinder? More than that…and please, stop me if I’m reading too much into it…but if I’m NOT, it’s awesome; She talks about her romantic life being dead and lifeless, at the same time she’s having a dead and lifeless part of her super-powered body being removed. I know that maybe this is a little on the “mind in the gutter” side, but isn’t the fact that a big buzzing machine follows Alison describing her love life as dead a kind of double entendre?